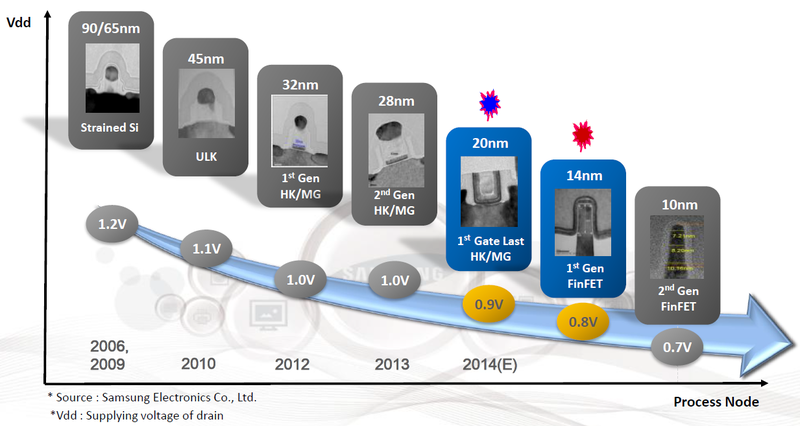 Winning by a mile against TSMC in the 14 nm FinFET race, Samsung now plans to maintain that lead against its primary adversary in the chip industry by announcing its plans for its next-generation process, 10 nm FinFET. TSMC has already stated that it plans to establish a 10 nm pilot line that will allow it to snare all 100 percent of orders for Apple’s A10 SoC, and future companies as well. However, Samsung has different and ambitious plans for the future, one that will greatly test the resolve of TSMC. With four foundries under its belt; two present in South Korea, one in Austin Texas, and one Global Foundries established in New York, Samsung currently has no competition in the 14 nm FinFET race, as the firm has already secured orders for Apple’s A9 SoC, along with Qualcomm’s Snapdragon 820. While the following has not been confirmed by Apple or Qualcomm, things are looking very good for Samsung as far as the 10 nm process is concerned in terms of securing future orders. This is because mass production of chips for both entities will result in a healthy relationship between the three tech behemoths, at least in the chip manufacturing business. One the other hand, TSMC is no pushover when it comes to chip manufacturing, and although the company was not able to overtake Samsung in the 14 nm FinFET race, the semiconductor manufacturing company has its sights triangulated beyond the 10 nm node, and is expected to commence manufacturing chips on the 7 nm process in 2017.